The companions of Chapter Elias Ashmole No 148 were honoured and delighted to receive Assistant to the Provincial Grand Principals David Randerson as principal guest and the representative of the Grand Superintendent Tony Harrison. Also in attendance were Jack Forsyth and Stan Churm supported by acting Provincial grand chapter officers; David Barr, John Goodrum, Ian Lynch, Phil Bolton, John Gibbon and Ian Rowan along with Chris Gleave, Warrington Group Vice Chairman. Pictured from left to right, are: Eric Delamere, Gary Oates and Samuel Boardman. Over 40 members and guests witnessed the installation of Gary Oates into the first principal’s chair and Samuel Boardman to the third principal’s chair. Andrew Anderson was to be installed into the second principal’s chair, however, he was away on business and will be installed at some future date. 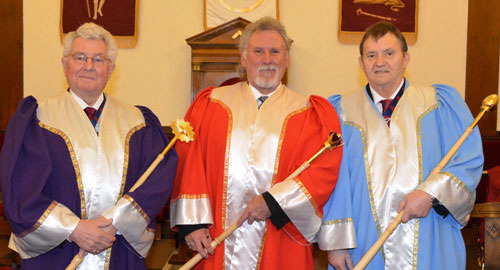 The chapter was opened for business by David Tabron the installing first principal, Gary Oates the second principal and Dennis Pearson as acting third principal. The distinguished guests were received by the three principals. David Tabron extended a warm welcome to all the dignitaries and visitors alike. He continued by hoping they would have an enjoyable evening. Samuel Boardman was presented to Dennis Pearson as installing third principal, the scripture reading was given by Ken Smith, with a prayer delivered by Peter Range. Similarly Gary was presented to David as installing first principal. The scripture reading was given by Jack Forsyth, with the prayer delivered by Matthew Oates. According to ancient custom Gary Oates was then installed as first principal, Eric Delamere (acting second principal) occupied his chair and Samuel Boardman was installed as third principal. John Goodrum delivered the robe address to the first principal and Dennis Pearson delivered the robe address to the third principal. Gary then duly appointed and invested his officers for the ensuing year. 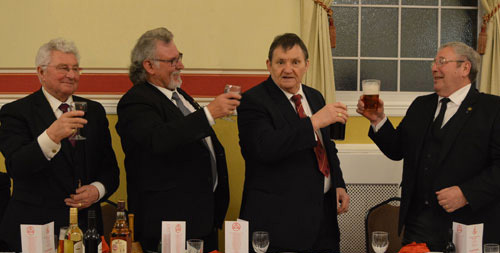 Pictured from left to right, are: Eric Delamere, Gary Oates and Samuel Boardman being toasted by Dave Tabron. Derek Bowden delivered the address to the three principals. Jeff Brookes delivered the address to the officers of the chapter and David Randerson the address to the companions of the chapter. All addresses were delivered with great dignity and humility in an exemplary manner. The installation ceremony being completed, David stood to bring the greetings of the Grand Superintendent Tony Harrison, whom he said would have been delighted to witness such a ceremony and particularly the work done by David Tabron in such fine fashion. David Randerson went on to thank the two principals for taking office, congratulating them on their appointments. He also made reference to the excellent ceremony and congratulated Gwilym Jones as DC. Gary thanked David for his kind words and proudly presented him with a charity donation of £750 to the 2021 Masonic Festival Fund and £100 to the Warrington Branch of the Salvation Army. David thanked Gary for the generous donation saying it was a credit to all the companions who had generated such a magnificent amount of money and said it would give him great pleasure in forwarding the donations. 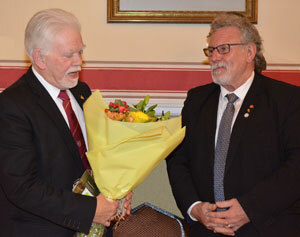 David Randerson (left) being presented with a bouquet of flowers by Gary Oates. Following the ceremony everyone enjoyed an excellent four course festive board which consisted of minestrone soup with bread roll and butter, cod mornay, braised lamb shoulder with vegetables and roast potatoes and fresh fruit salad with ice cream. This was served with red or white wine and followed by tea or coffee. David responded to the toast to his health by congratulating all the officers taking part in the ceremony. He also congratulated the two new principals and he hoped that Andrew Anderson would be installed at some future date. He continued by hoping the chapter would have a busy and enjoyable year. He thanked the group officials for their support in attending and John Gregory for the work undertaken throughout the year and particularly tonight. He continued by extending his thanks to acting Provincial grand officers David Barr, John Goodrum, Ian Lynch, Phil Bolton, John Gibbon and Ian Rowan. A raffle generated a wonderful sum of £125. Just before the janitor’s toast to close the evening, David was presented with a bouquet of flowers by Gary and David thanked all the companions for their generous gift. Article and pictures by John Starkey. David Randerson with the three principals and dignitaries.